Thread: Mules will destroy the nice pants guy. I keep going back and forth on going to this game. I recently relocated to the Olathe so it's not a bad drive. I just know it's not going to be a very good game. Mules should have the starters pulled mid 3rd quarter. The Mules will win the MIAA this year and the Ichybods are just a bug on the windshield. My man Bradley throws for 400 yards and 4 scores. Hunt runs for 150 and 2 scores. Re: Mules will destroy the nice pants guy. It will be interesting to see if WU can get to the UCM QB. They run lots of 3 man fronts with lots of moving parts and blitzes. Not likely. Hunt is the passer and Bradley is the runner. Olathe was always in the third tier. They were the ones that started saying JoCo while Leawood and OP went with, and still go by, city name. Did people really refer to where they lived as Shawnee Mission at one time? I'm a relative newcomer to the KC metro, and I never hear that outside of someone describing the Shawnee Mission school district or one of the SM high schools. Now it's all super-specific. "Old/Downtown Overland Park" or "West Shawnee", etc. Of course, Overland Park is so big that the old downtown area is nothing like southern OP. Also: Olathe North churned out Darren Sproles and my slightly less-famous wife in the same graduating class. That town is OK by me. 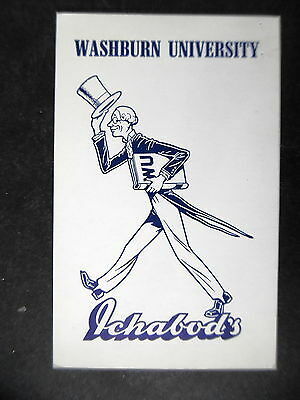 I can remember this '50's version of Washburn's mascot. My daughter was in the "sandwich" classes for Olathe North where they won state championships before and after she graduated - not during. She was in the class that James Franklin was in - a real shame what happened to him. Ah well, I like to think Pitt State got one of the greatest clarinet players for the marching band in my daughter - even if it is just my opinion! Yea, Mission, Merriam, Shawnee, OP, all of those little towns in NE Johnson County were "Shawnee Mission". Again, that goes back to me living there 50 years and me sometimes calling Shawnee Mission Parkway - 63rd Street or Highway 50 or even more old school K-10. LOL . I moved to Olathe in '89 before most of the sprawl happened. Anyway, this UCM v. WU game, in the immortal words of Keith Jackson, should be a slobberknocker. Johnnie Walker's lawyers are calling Wisconsin for advice about now. Might want to reconsider that move to Kansas. Get to him they did. He's gonna need therapy for the nightmares about 9 man blitzes he's going to have. Well, guess we won't see juiced mule till next year after this game!